Whatever your business is, we’ve got the experience, quality productm and outstanding service you need! We bring the Red Wing Mobile Shoe Sales experience directly to you with minimum hassle and maximum value! Comfort on concrete starts here. Industrial accounts are a huge part of our business, and we value each and every relationship. Whether you work or manage a local department or a huge manufacturing facility, it’s all the same to us! As a Red Wing customer you can expect the same service, experience and attention to detail you’d receive when you walk into one of our retail stores. When you work with Red Wing Shoes Richmond, we deliver maximum comfort. However, just as importantly, our work boots provide your employees maximum safety. We ensure that all of your crew have the same great protection that only Red Wing work boots and shoes can provide. We work hand in hand with our points of contact to schedule a time to come to your location and fit your whole team. What we bring to your location all depends on what you need, IE different styles, toes, etc. We customize our mobile shoe sales truck and inventory to best “fit” your team’s needs, budgets and expectations. For that reason, we always consult with our client prior to your appointment. We like to know as much as possible about your specific industrial shoe sales needs before you jump into any kind of partnership with us. As with all things Red Wing: we’d rather get it done right than get it done fast! Don’t see your city listed here? No worries! Call us at 804-323-5979 to discuss your needs. We can discuss how we can potentially help you, and any questions you might have. Odds are we can figure out a way to bring the quality, longevity and durability of our legendary Red Wing shoes directly to your location through our mobile shoe store! 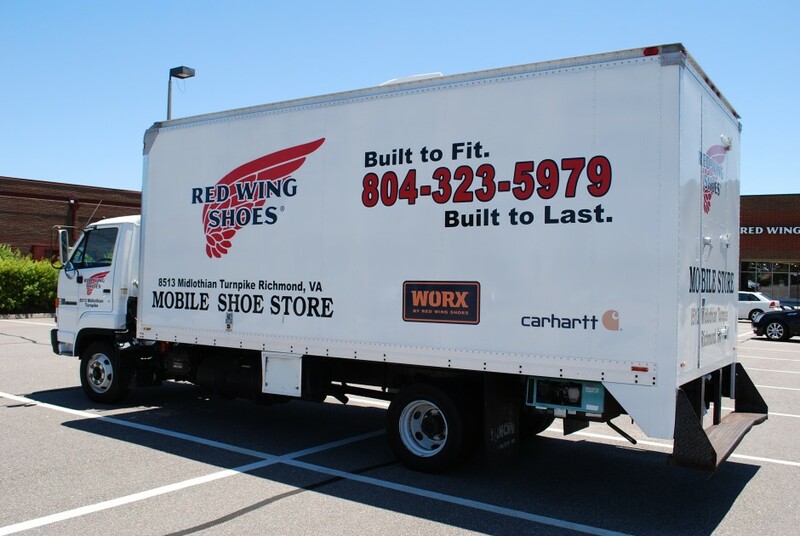 We’d love the opportunity to bring the Red Wing Mobile Shoe store to you and your whole team without having to leave the job site.